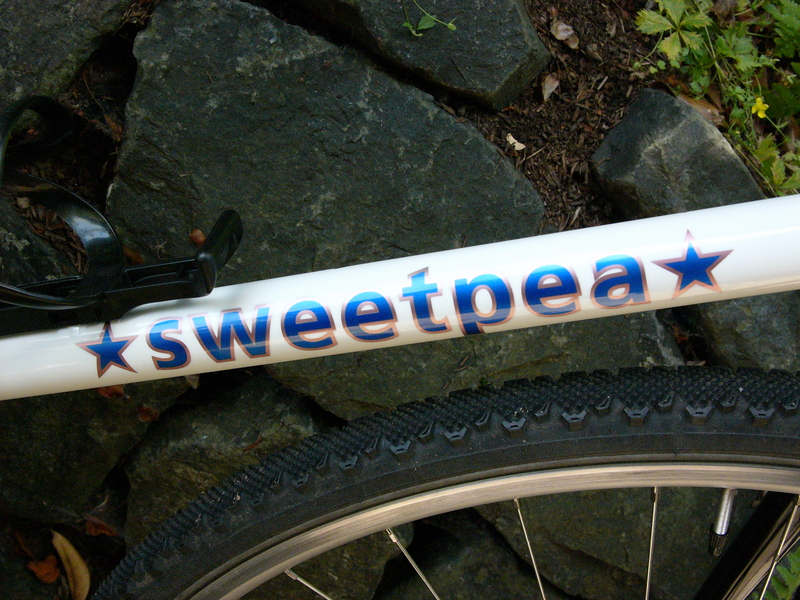 This 2010 Sweetpea is NOT a vintage bicycle. 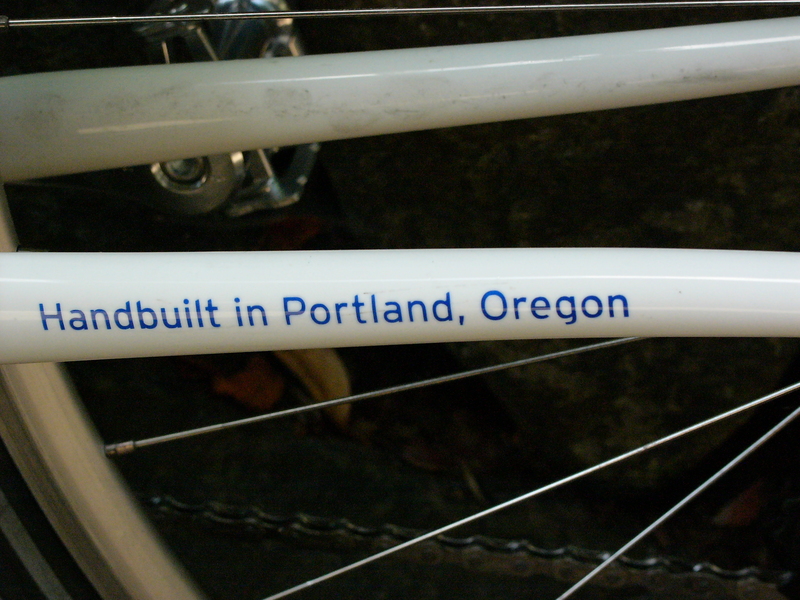 But, it was custom made here in Portland by Natalie Ramsland, frame builder and owner of Sweetpea Bicycles. 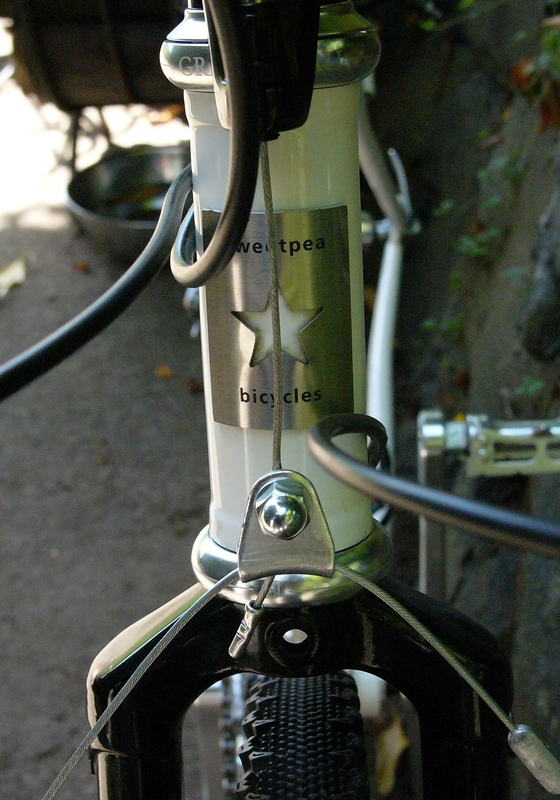 It is a fillet brazed steel frame featuring curved rear stays and an 11 degree sloping top tube, with braze-ons for cantilever brakes and over the top tube cable routing, as well as fender and rack mounts. 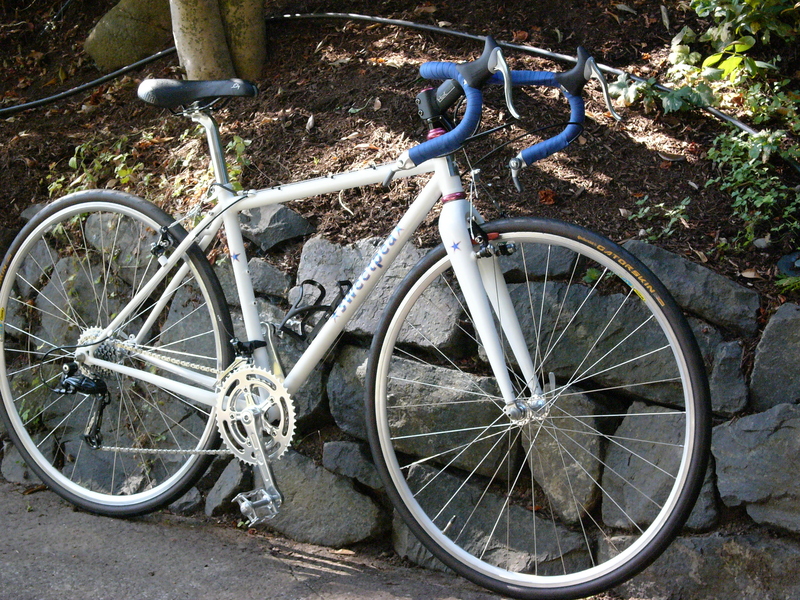 I purchased this bike as a frame and fork in 2011, after it had been ridden for one season as a cyclocross racer by a team rider here in Portland. 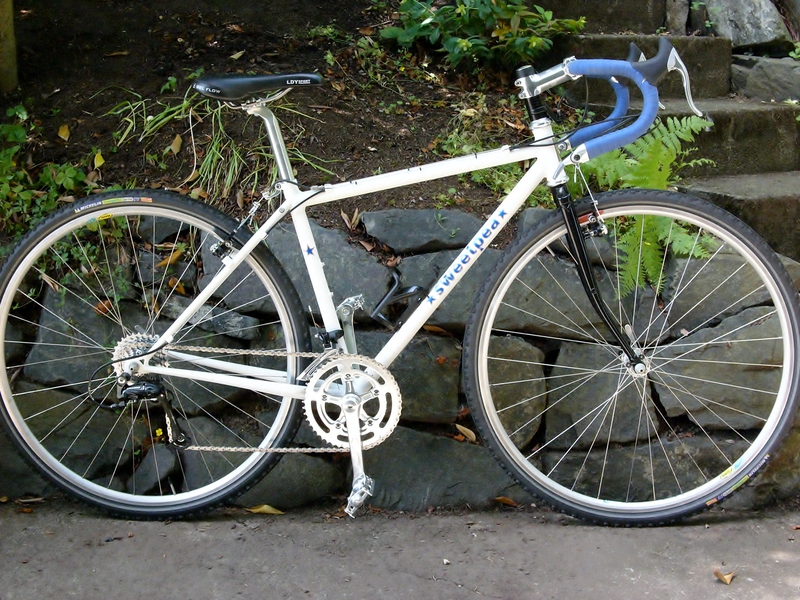 The rider had been recruited to a new team with its own brand, so she wasn’t going to be competing on the Sweetpea any longer, which had been custom built for her cyclocross racing endeavors. So she listed the frame for sale and that’s when I snapped it up. 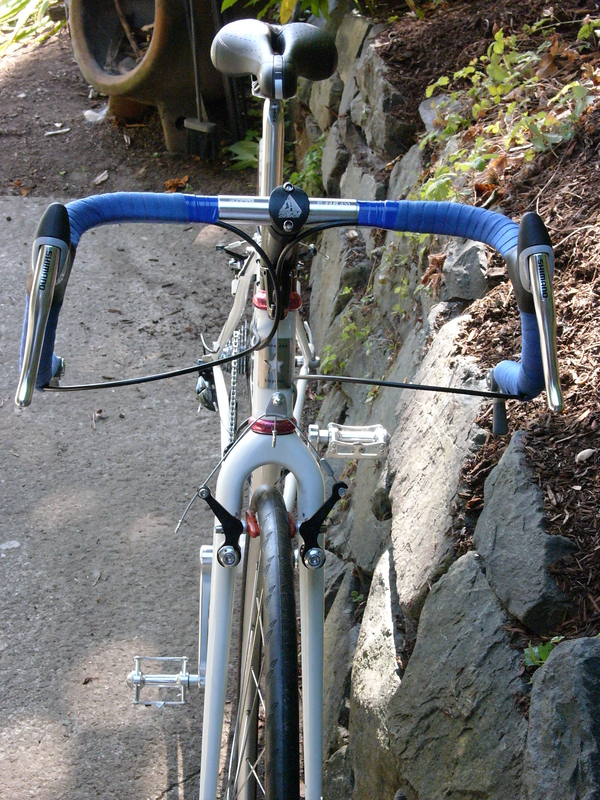 The original fork was carbon, shown above, painted to match the frame. 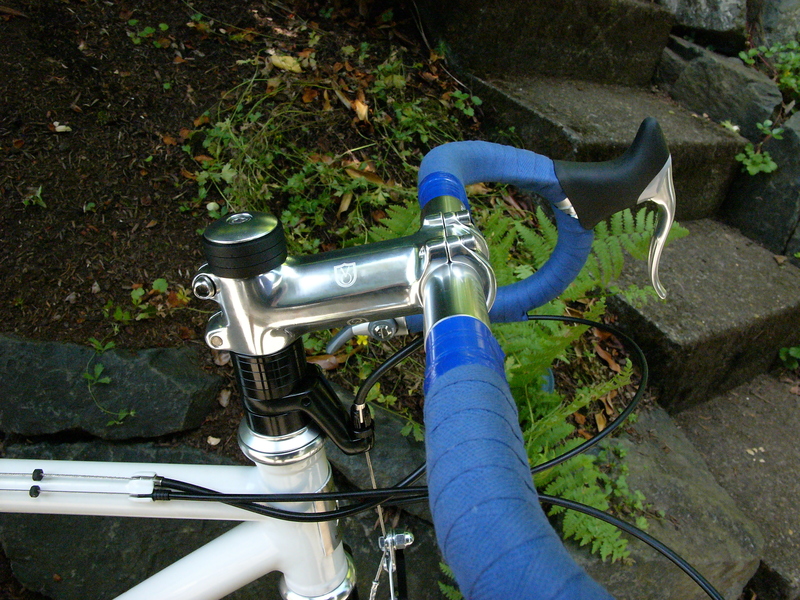 I rode the bike with the carbon fork for several hundred miles after building the bike up. The feel of the carbon fork was very alarming to me. It felt dead and kind of strange. The fork had no control feel as compared to the precision and comfort provided by a steel fork. Once removed from the frame, I examined the beautifully painted carbon fork only to discover tiny cracks around the fork crown. My conclusion was that the carbon fork was failing. 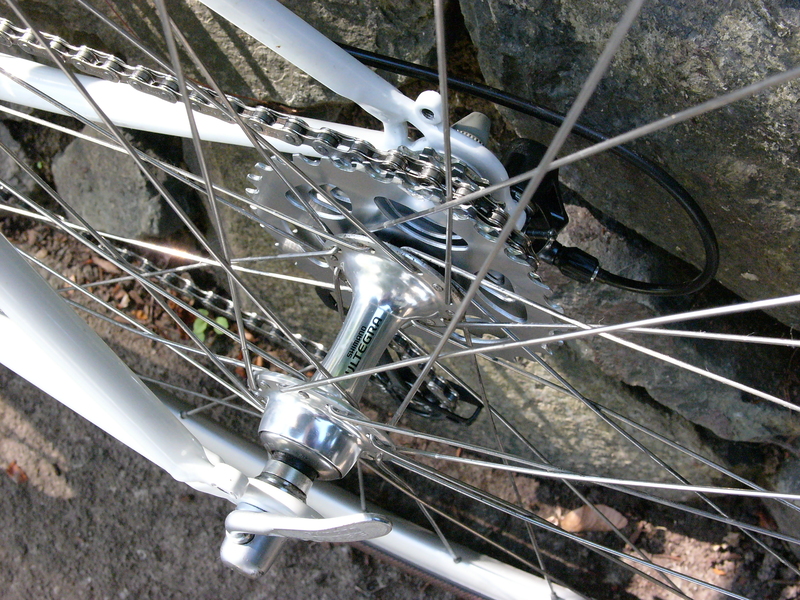 I sourced an exact match in length and rake from Surly – a black lugged steel fork with cantilever braze-ons – and then removed the Surly logos once I had the new fork mounted. What a difference that made to the handling and comfort of this bicycle. And, I really like the contrast of the black fork against the cream colored frame paint. Ramsland’s work on this frame is very nice and the custom paint job draws much attention. 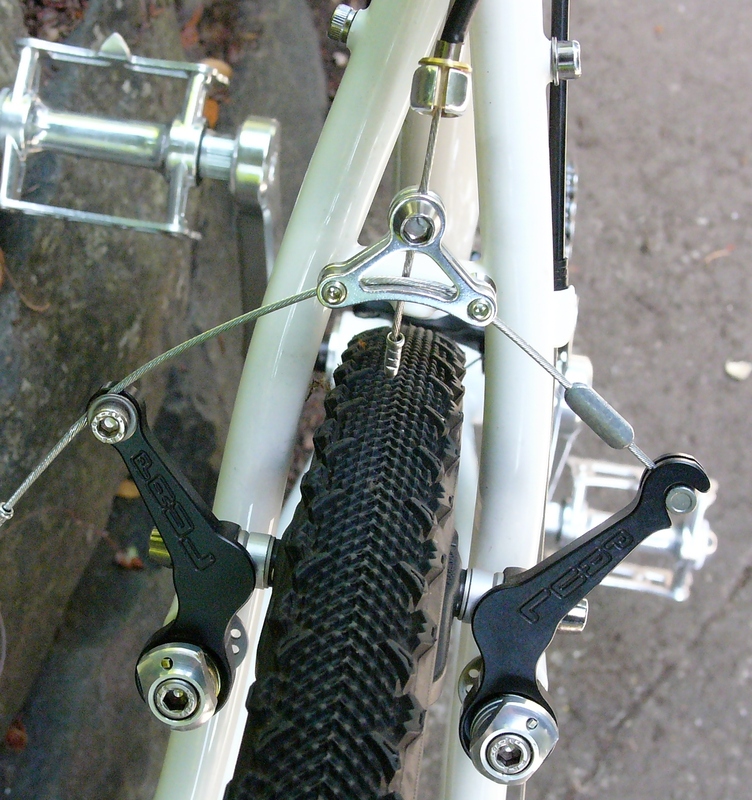 For the rear brake hanger, I used a Problem Solver’s solution to accommodate the small space between the hanger and the straddle cable. 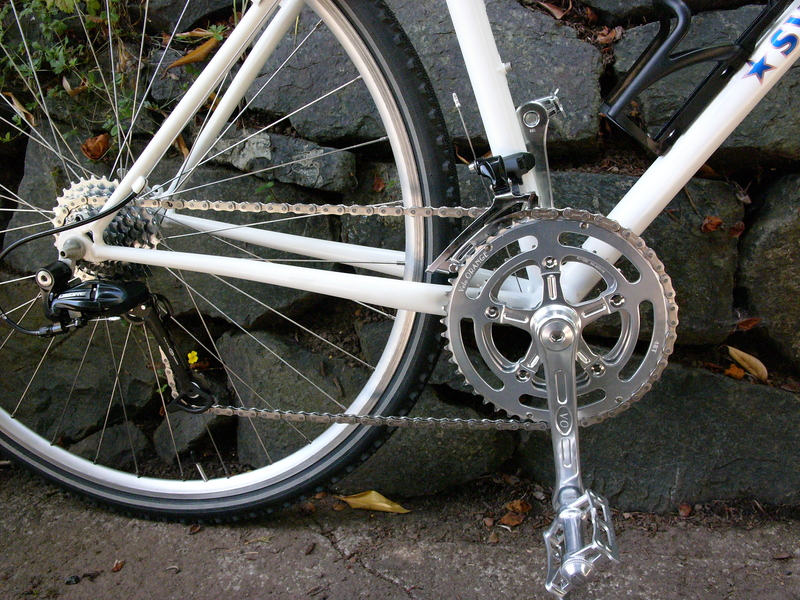 The rest of the build was done with some of my favorite components, as well as a few new ones that I wanted to try out: Paul’s cantilevers, Shimano derailleurs, and a Velo Orange compact crankset. 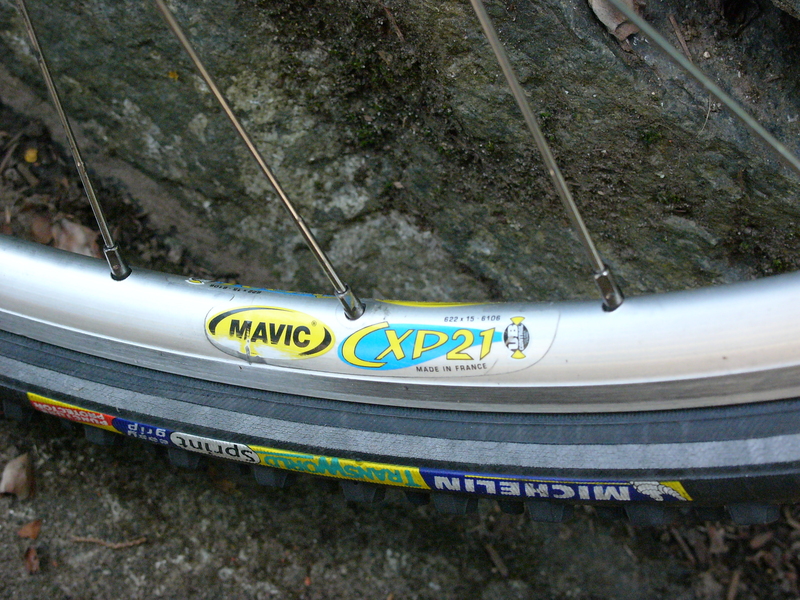 I used 700c Mavic CXP 21 32 spoke rims on Shimano Ultegra hubs – a very beautiful and competent wheelset. 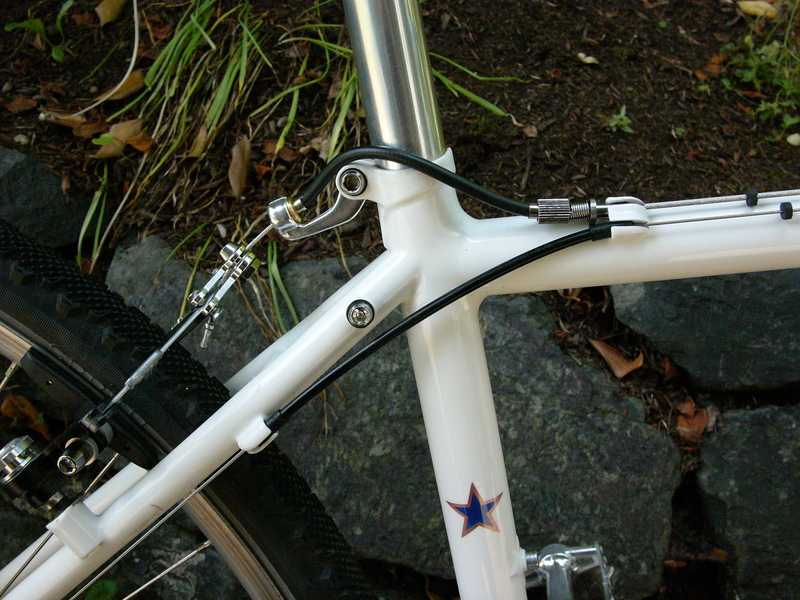 Fillet brazed steel frame with lugged steel Surly fork, custom geometry. 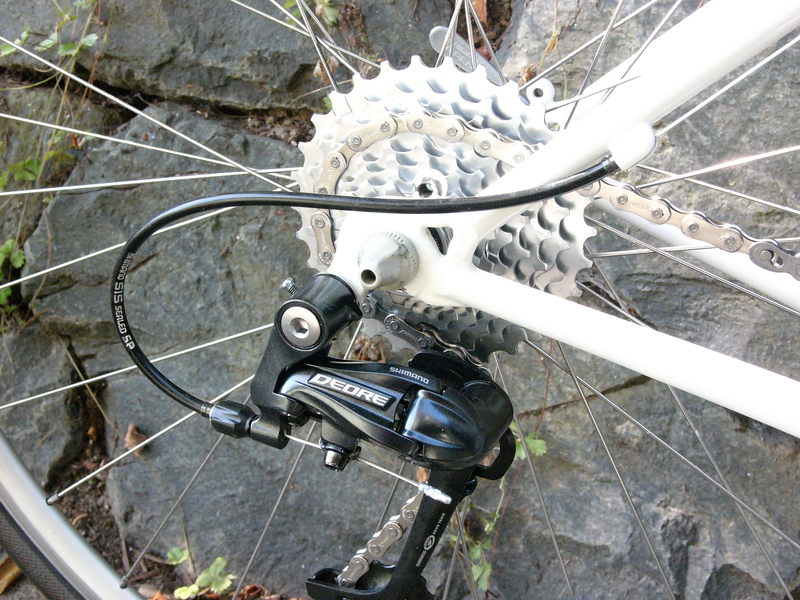 Shimano 8 speed bar-end shifters; Shimano levers, 105 front derailleur, Deore rear dear derailleur Shimano 11-30 8 speed cassette, Shimano cartridge sealed bottom bracket. 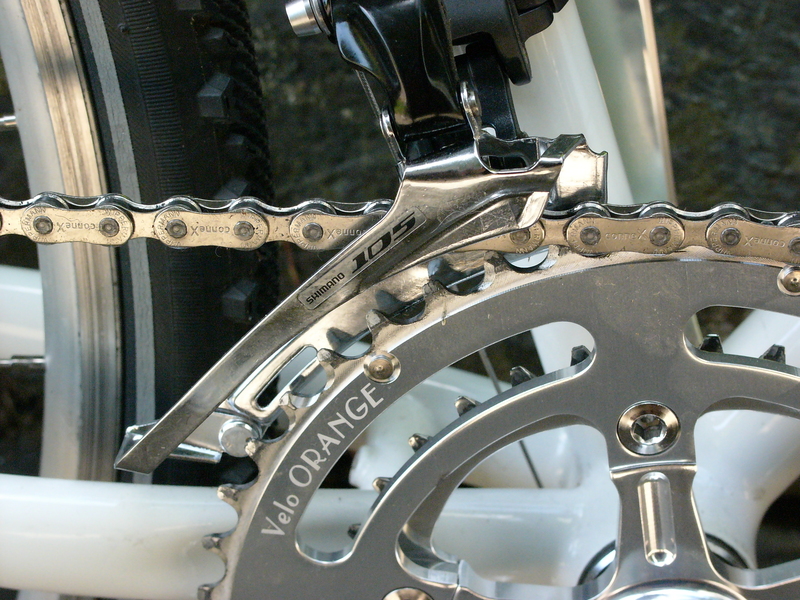 Velo Orange Grand Cru crankset 48T/34T. Nitto Crystal Fellow seat post; B 115 bars, Selle Italia Lady Gel Flo leather saddle, 700c Mavic CXP 21 rims on Ultegra hubs, 32 spokes front and rear (built by Wheelsmith), Michelin Trans World Sprint cross tires, Velo Orange Headset and Stem, Wipperman chain, Paul Touring Cantilevers, Newbaum’s cloth bar tape, Gear inch range: 30 to 116. The bike is for sale on my Store page. If you are interested in purchasing just the frame and fork, please get in touch. 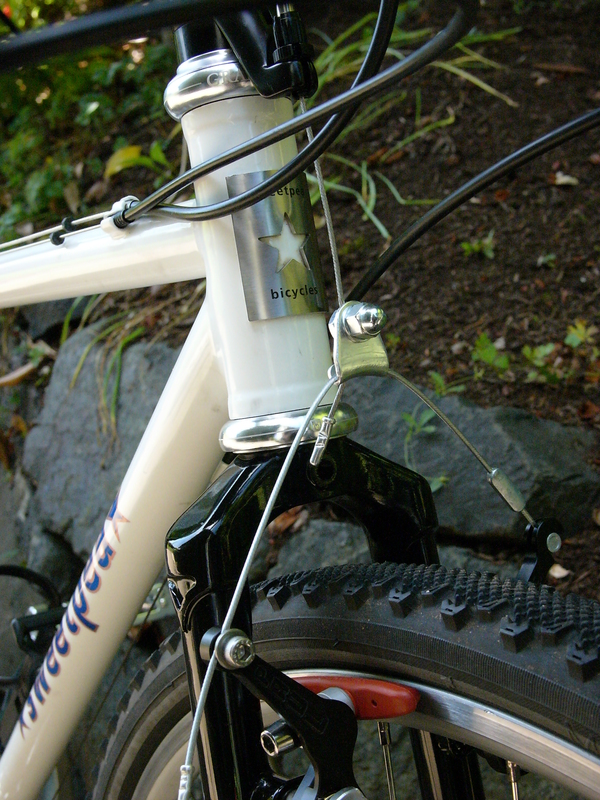 This entry was posted in Bicycle restoration, Cyclocross, Frame builder, Shorter cyclists and tagged Cyclocross bicycle, Natalie Ramsland, Paul's Cantilevers, Surly Steel Fork, Sweetpea Bicycles by Nola Wilken. Bookmark the permalink.